The more Kathleen learns, the more answers she seeks concerning her familys mysterious past. Yet with the past exposed, Kathleen is torn between her need to forgive and the urge to forget. 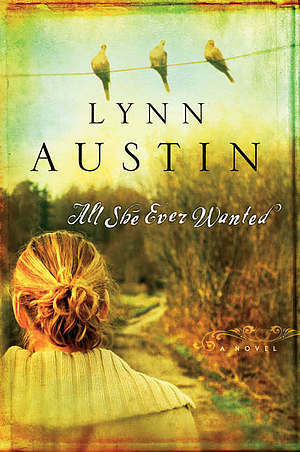 All She Ever Wanted by Lynn Austin was published by Bethany House in October 2005 and is our 19281st best seller. The ISBN for All She Ever Wanted is 9780764228896. Lynn Austin weaves a beautiful story of relationships,(most between mothers and daughters) and how understanding and sharing our pasts helps us understand our present. This is the third book I have read by Lynn Austin. She is such a gifted writer! I could hardly put the book down. I HIGHLY recommend this book!!! She has become one of my favorite authors. All She Ever Wanted is a very well-written book about relationships and the necessity of forgiveness. As Kathleen Seymour discovers the truth about the pasts of her mother and grandmother, she and her daughter Joelle begin to mend their torn relationship. Kathleen learns that when hard times occur, running away from them is not the best answer. Got a question? No problem! Just click here to ask us about All She Ever Wanted.